Welcome to this crazy day of linky love and blog exploration! I love to see what is new out there in blog land. Get started clicking away to view everyone's creations! Please stick around and click on at few a links before leaving. Don't be a link-and-run blogger! If you are needing or wanting some vinyl, check out Say It On The Wall. You can definitely have all your vinyl needs met here! I'm loving this tip like everyone else did at Racks and Mooby about how to make your snacks go further. Great idea! I'm excited about this month's Crafting for a Cause!!!! Won't you help make a blanket for The Linus Project? See more details at Ladybird Ln. This week's tip by Seven Thirty Three - A Creative Blog. HOW TO: Add a "pin It" button from Pinterest to all your posts. Wahoo! This actually will send you to Sugar Bee. 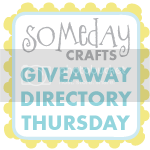 Don't forget to check out the Giveaway Directory tomorrow! It amazes me how few people enter giveaways. This is your chance at free stuff! FYI, this link is only open for two days. If you are going to do a giveaway and want to feature it here, make sure you link it up sometime on Thursday or Friday. Easter is coming quickly! Spring is basically here! Did you check out any of the links from last weekend? Link up your projects and see others HERE! Thank you for hosting! I'm so glad to see all the spring creativity! thanks so much for the party, I love seeing all these great things! Thanks for hosting! Off to look around. Have a great week! Happy spring to you! Have a blessed day and thank you for hosting. Thank you for hosting. Happy Wednesday! Thanks for hosting such a great party full of fantastic ideas Michelle! ;) have a wonderful day! Michelle, thanks so much for hosting. Thanks for hosting, it is one party I rarely miss. LinkInz must be having trouble, many of the pictures would not come up, mine included. So I am incognito. Thanks mucho for hosting (: Happy Wednesday to you! Thank you for hosting the hop. Added your hop badge here: http://olahmomma.com/momlounge/wednesday-blog-hop. Following your FB, twitter, and Pinterest.